At a meeting for the year’s first press conference with student media, Chancellor George Blumenthal (left) and executive vice chancellor Alison Galloway (right) addressed student media’s most urgent concerns. 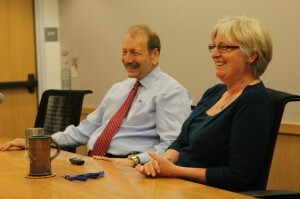 While the discussion focused on serious topics, the pair managed to keep the tone positive. Photo by Prescott Watson. Student media news organizations put hard-hitting questions to Chancellor George Blumenthal last Thursday. Newly appointed executive vice chancellor Alison Galloway joined us at the chancellor’s quarterly press conference. Among other issues, the administrators responded to queries about student activism and the future of campus programs. City on a Hill Press: What went into the decision to appoint Allison Galloway as our new EVC? Blumenthal: I really feel very, very lucky, because at the same time last year that we were doing our EVC search, several other campuses were doing EVC searches as well. Some of them were unable to complete their EVC search and make an appointment. I had four outstanding finalist candidates, any of whom could’ve stepped into that position. But in choosing Allison, I was motivated by the fact that she is very committed to the campus. She understands the campus well, and she really has demonstrated her ability to administer programs … I think Allison brings the whole package, and because we worked together in a variety of different capacities over the years I thought that we would work well. And lastly Allison isn’t afraid to tell me when I’m wrong. TWANIS: What do you want to be your legacy at UCSC? Blumenthal: First, I’d like people to look back and say that during our term here, the university continued its upward trajectory among universities in the country and the world. I think that was true as I was coming in as chancellor, and I’d like to continue that trend and really move it forward in a very meaningful way. Secondly, I’d like people to look back and realize that this was a very difficult financial time for the university, and that we found ways to stabilize the university during what were very difficult times and prepare us for hopefully better times ahead. KZSC: You talked last year about increasing the graduate student population to help the undergraduate population in their quality of education — how is that going? Blumenthal: I actually really believe in my heart of hearts that graduate students do benefit undergraduate students, and we have one of the lower, or maybe even the lowest, percentage of graduate students in the UC system … it seems to me that for a research university we could benefit from more graduate students, and I think our students would benefit. I’d also remind you that our graduate students are not evenly distributed around campus, we have a much higher percentage of graduate students in the sciences and engineering, for example, than in the other divisions, which makes me very gratified that over the last few years we opened new Ph.D programs more broadly across campus in social sciences and humanities, and that we’re now starting two new Ph.D programs in the arts … if your question is where should we make investments, graduate students versus more classes for undergraduates, those are hard choices, and we’ll have to look at all of those choices. I think that that’s a priority just as making sure that resources are available so students can get classes. I don’t see the two as being mutually inconsistent. Both of them are important priorities. City on a Hill Press: The TA’s union on campus has asked you to be somewhat of an advocate for them to the UC Regents in their contract negotiations — how specifically have you been able to do this? Blumenthal: Of course, I can’t talk in detail about union negotiation … collective bargaining doesn’t take place on this campus, it’s system-wide bargaining, it isn’t really with the regents, it’s really with the UC president, the president has the authority to agree to a contract with unions. We have input into it, we have representatives on the bargaining team, those issues are discussed with the chancellors, before agreements are made we all get to comment on them and provide input. I think our graduate students in general, TAs in particular, are a really key part of the campus. TAs have it tough, not only are they students but they also teach. It is a job, many of them have families to support, I think it’s really important that we make sure that they are able to survive in a reasonable way. TWANIS: Are you going to make an effort this year to come to rallies and show public support for the UAW/students in general? Blumenthal: I will be out there, and I’m going to try to be accessible to people. I’m more than happy to talk to anyone as long as the conversation takes place at a reasonable decibel level. I do keep office hours, I am available for people to talk to. Second, there is a presumption that chancellors are all powerful … I think there is a power in the ability to be persuasive, and to persuade the appropriate decision makers of the rightness of a position. Just because you may not see me doing it doesn’t mean that I’m not an advocate for certain positions. I am a part of the management of the university, and to the extent that a union negotiation is management versus union, it would not be appropriate for me to speak outside of normal channels in that regard. I certainly can be available to listen to concerns, I can talk to people to hear what their concerns are, and use my voice, which I actually believe is a lot, to be persuasive about the right things to do in terms of negotiations with the Office of the President. I would never write an open letter to the president urging him to do something, for example. I think that would decrease my credibility with the president even if it might win me some brownie points with those who want me to be more openly an advocate. KZSC: What are your thoughts on the student activism against the UC? Blumenthal: There’s nothing wrong with activism, I was an activist myself as a student. I encourage our students to speak out, I think it’s great that Santa Cruz as so many students whose voices want to be heard. There are lines, though. Sometimes, activism that exceeds what I think are the appropriate bounds of behavior can be negative for the university. I spend a lot of my time with donors and legislators, and I’d rather be talking about what they can do to help the university really provide education for a broader spectrum of Californians than having to defend the university against accusations that our students don’t understand the good things that they have. I think that activism, if it’s overboard, or it exceeds the appropriate level of behavior of respecting other people’s rights, I think that that can actually be a negative for the university. And it detracts from the conversation. City on a Hill Press: This summer the New York Times published a story about Mark Yudof’s residence — how do you think it reflects on the University of California that the president’s rent monthly is more than a student’s annual fees? Blumenthal: Each of the ten chancellors has a chancellor’s residence on campus, which we use … it’s a very legitimate thing. It turns out that the president has for many, many years an official residence. It’s a very large house, and I would never live there. It’s run-down, I would be afraid it would collapse around me if there was an earthquake … so when Mark Yudof was appointed president the university faced a decision of what to do … the cost to fix Blake House is $10 million, rough figures, I don’t know it exactly. The university felt it shouldn’t do that, so the decision was made, instead, to rent him a place in the Berkeley-slash-Oakland area. Now, it had to be a large enough residence, to be frank with you, to do a couple of things. One, it had to provide the opportunity to entertain … he uses his house to entertain and that’s an important part of the job, so I think it was appropriate for the university to rent a house for him. There’s also a second issue, which is security concerns, and so they had to rent something that they felt would be a secure place for him to live. As for the exact rent, well, they weren’t going to put him in a $100-a-month apartment. I can’t comment on exact numbers … what can I say? Rents are expensive in Oakland. I think it’s legitimate that they rented him a house. Next articleFree Music? At What Cost?